This car first makes its appearance in Classic in the Barn but Jack is going to make sure that it appears just as often as it can in the novels and short stories that follow. One hundred of these fabulous supercars were built between 1963 and 66 with over 90 units surviving around the globe, mostly in the UK. Designed by John Gordon and Jim Keeble using current racing car principles with the bodyshell designed by 21 years old Giorgetto Giugiaro at Bertone, the cars were an instant success but the company was ruined by supply-side industrial action with ultimately only 99 units completed even after the company was relaunched in May 1965, as Keeble Cars Ltd. Final closure came in February 1966 when the factory at Sholing closed and Jim Keeble established a new company, Keewest. 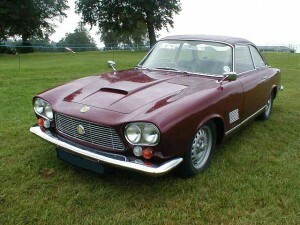 The 100th car was completed in 1971 with left-over components. Its emblem is a yellow and green tortoise.